I chanced upon your website and am very impressed with your work. 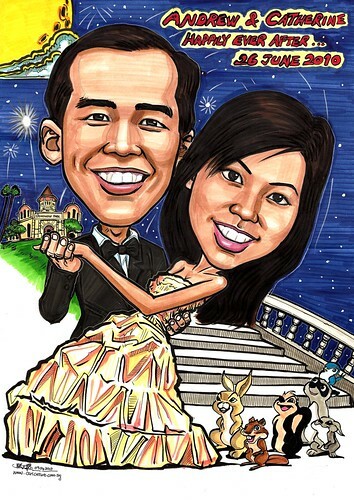 I would like to have a color caricature done for our wedding poster (A1 size). I have attached a version of how we would like the poster to be and our photo. The theme of our wedding is fairy tale and we are holding it at Goodwood Park Hotel. So we would like to have the hotel in the background like a castle with fireworks and we are dancing in the foreground with animals surrounding us." The client changed to A2 size eventually. Still quite big for a couple caricature. What I worried was the fireworks may not turn out good. I used pastel pencil + colourpencil + blanko to do it. Didn't look too bad, especially when framed up.